Fireproof home safe gives individuals the protection the need. 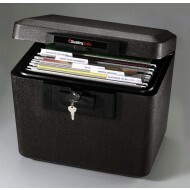 They provide a way to secure important documents and other valuables. 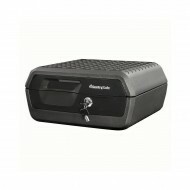 The fireproof home safes listed on this page are designed to be bolted down to guard against theft. Special insulation and door seals provide the 1/2 hr to 2 hr fire protection these models offer. All these models are less than 34" high. If you need a larger fire rated model, click below. These models are equally appropriate for the office or retail store. 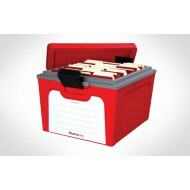 Many people buy these models to store important office papers and extra keys. 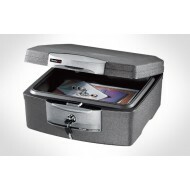 All of the Sentry models are rated to protect media such as DVDs, CDs, USB drives and diskettes. Sentry DS0200 come with an ETL 1 hour rating* for protection of CDs, Memory Sticks, and USB drives up to 1700F. Perfect for home and office. The DS0200 is UL Classified for up to 1 hour fire protection. 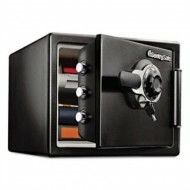 It includes a 3-number combination lock and -- for extra protection -- is designed with four live-locking bolts. It can also be bolted to the floor (hardware included). The inside of the safe has a key rack and a compartment for small items. 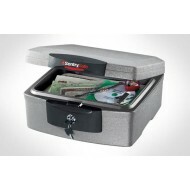 The SentrySafe SFW082DTB safe provides "around-the-clock" protection against theft and fire. The door has 4 live-action locking bolts and a 3-number combination lock that also requires a key to open the door. Organization is made easy with a key rack, door pocket and mulit-position tray for small items and letter size papers. Folders and binders can be laid flat. This product has been discontinued and is out of stock, please see bottom of product detail page for suggested replacements. The SentrySafe OS0401 safe provides "around-the-clock" protection against theft and fire, keeping your important data and electronic records safe and secure. The door has 4 live-action locking bolts and a 3-number combination lock. Organization is made easy with a key rack, door pocket and mulit-position tray for small items and letter size papers. Folders and binders can be laid flat. 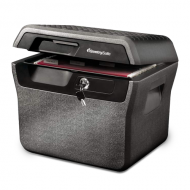 This Sentry safe provides great protection for both paper documents and media such as DVDs, CDs, and flash drives. 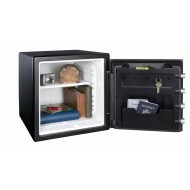 WIth a UL 1 hour fire rating plus an ETL 1 hour fire rating, you have double protection for the contents of your safe. In addition, this model carries the ETL fire resistance label and the ETL impact resistance label. This is a combination lock fire safe with a multi-position shelf and key rack.